This past weekend, University of Rochester went 6-0, playing only one game in-range to earn their first Northeast Regional Championship in a rout of the field. Their dominant performance leaves little doubt in anyone’s mind of their merit taking home the Northeast trophy. 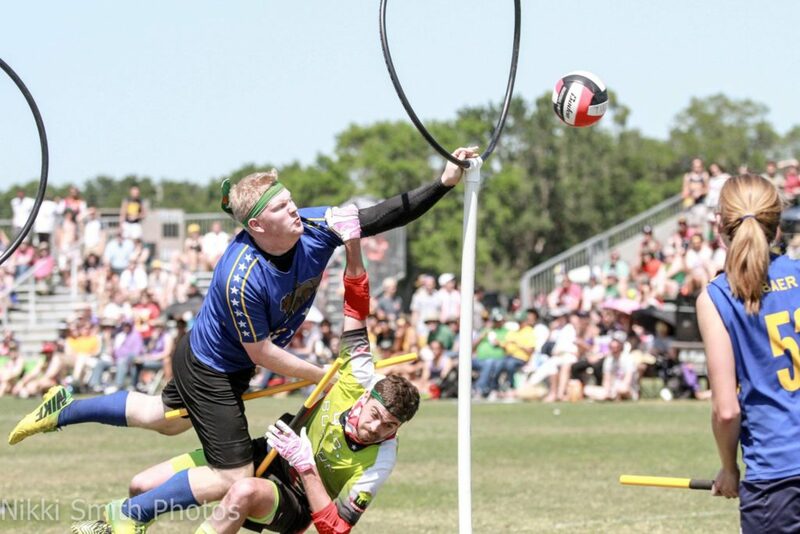 Just across the pitch, however, Quidditch Club Boston was awarded the Club Championship and only guaranteed bid to Nationals in a performance that was not quite as conclusive. Heavy rain and snow in the Rochester area led to tournament delays on day two that resulted in the final three games between Boston, Rochester United and the BosNYan Bearsharks being cancelled. Event staff made this decision in order to prioritize the completion of collegiate brackets in the face of rapidly deteriorating field conditions (as the day went on, multiple inches of standing water on the pitches quickly turned to multiple inches of mud). This allowed a collegiate champion to be crowned and college bids to be accurately assigned. The cancellation of the final six club games left Boston with the best record of 5-1, having won both of their games against the Bearsharks and going 1-1 with United. This meant Boston walked away with the title and the only guaranteed Northeast club bid to Nationals*. While this decision allowed for the completion of a college bracket and two clear victors at the expense of the fully-scheduled round robin, had conditions allowed the full schedule to be played, five distinct outcomes were still possible to conclude the tournament. In situations where Boston beats United, they can afford losses to BosNYan and the Atlantic Dragons and still come away with the trophy on head-to-head tiebreakers. In this situation, despite losing to United head-to-head, Boston finishes 7-2 while United finishes 6-3, giving Boston the win on record. In this situation, United finishes with a 7-2 record and beats Boston on head-to-head tiebreakers, no matter the results of Boston’s other two games. In this unlikely situation, United and Boston would end up tied at 6-3 above BosNYan at 5-4, and United would win on head-to-head tiebreakers. In this situation, BosNYan would need to win their three final games, and Boston would need to lose to United to leave the three teams tied at 6-3. BosNYan would need to win two of those games while leading in quaffle points in order to ensure that they would win the Record-Before-Snitch-Catch tiebreaker, as no team would win the head-to-head tiebreaker. While a Boston victory was certainly the most-likely outcome no matter what happened, it is clear that it was far from guaranteed. Given that every game between these teams except one this weekend was in-range, had the Rochester climate been more amenable there is no sure guarantee that this tournament would have ended with a Boston victory. * It should be noted that United (#12) and BosNYan (#15) are almost guaranteed at-large bids to Nationals as two of the highest ranked club teams in USQ’s Standings. **All percentages here are calculated using The Eighth Man’s Elo Ratings.